The weather that was predicted for the weekend, rain and blustery winds, is actually happening today. Saturday and Sunday, as it turned out, gave us blue skies, sunshine and comfortable temperatures at Deception Pass State Park. This is often the case here in the Olympic Rain Shadow. I cancelled the "official" hike because of the weather forecasts. Also because I didn't expect to see much blooming yet in the grove. I did sneak over there late yesterday morning to see how things were going. Once again, only that single blossom mentioned in the previous post had opened a bit more. None of the other buds were showing any color at all. I think it will be at least two weeks before the grove is in full bloom. 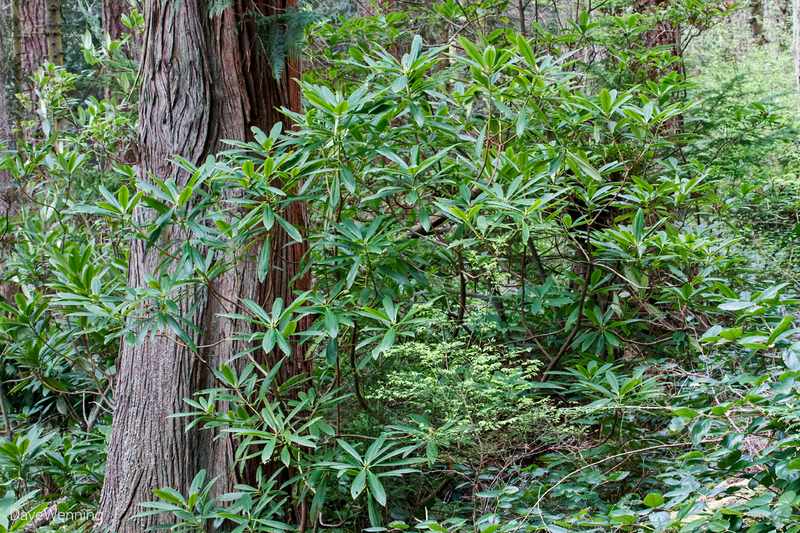 If you would like to join me on a hike to see the wild Pacific Rhododendrons at Deception Pass, watch my Twitter stream and look for the hashtag #rhodyhike. I am currently planning on the next hike for Saturday, April 18, 2015. We will meetup at the North Beach parking lot at 08:30 a.m. Details about the hike including driving directions are here. Western Starflower (Trientalis latifolia) is just starting to bloom. 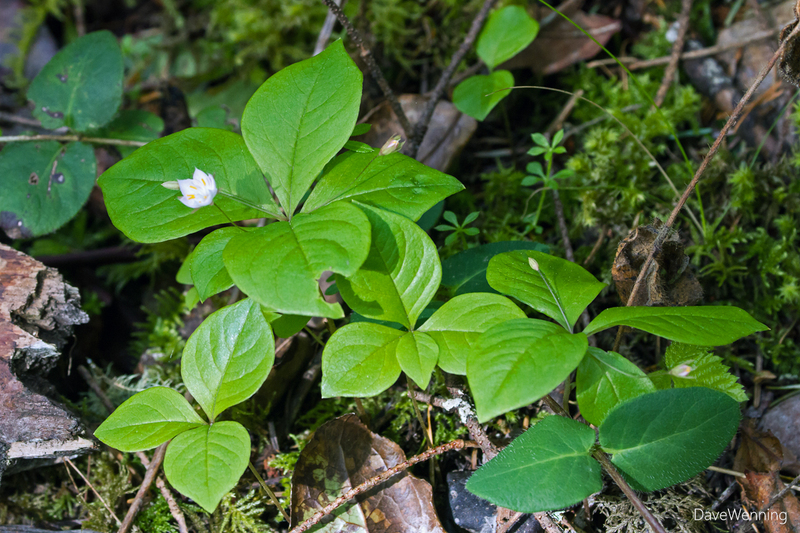 This little native wild flower is ubiquitous along the trail edges all over the park. It also comes up in my garden. 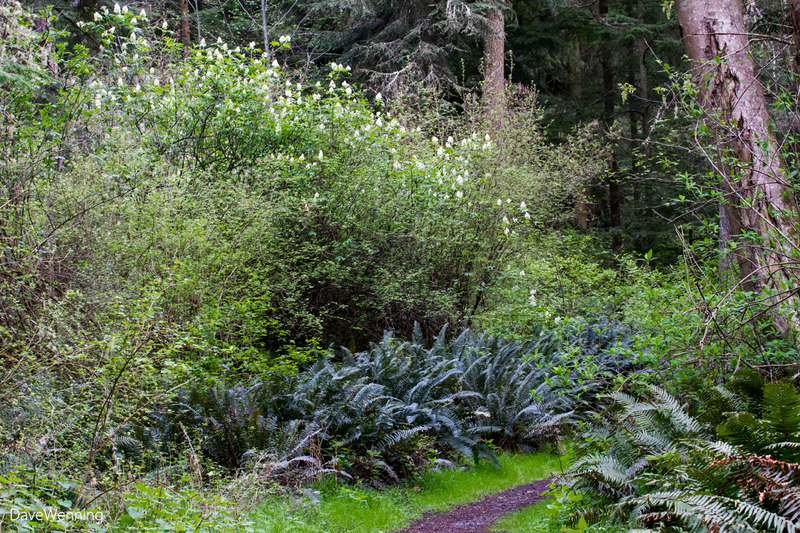 Pacific Northwest forests are hosts to several species of orchids. 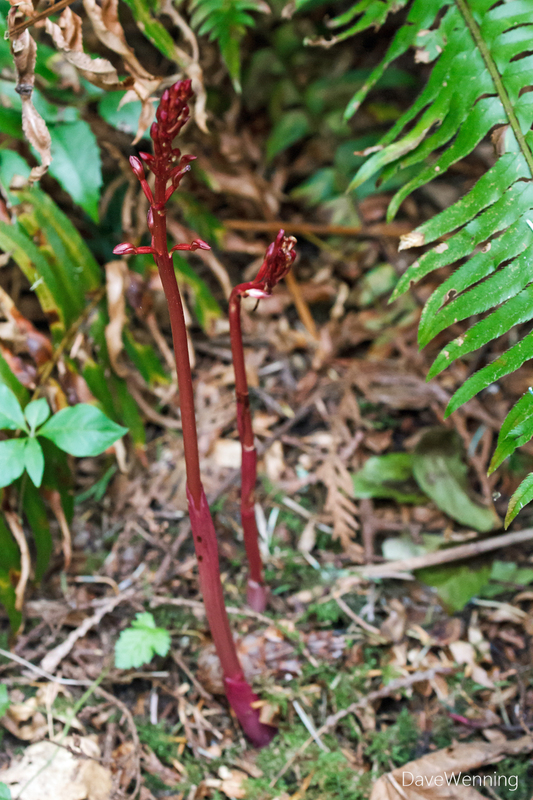 Left, shoots of Spotted Coralroot (Corallorhiza maculata) are just emerging. 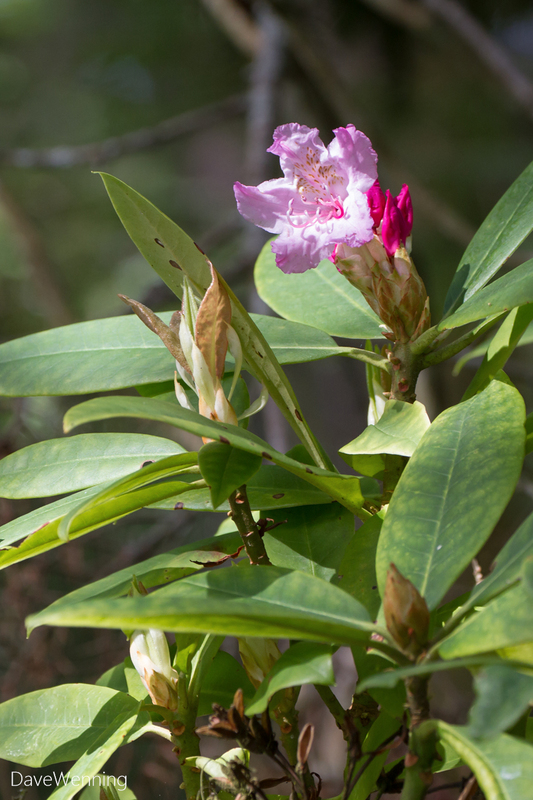 Chandeliers of tiny orchid flowers will appear at the same time as the rhododendron blooms. 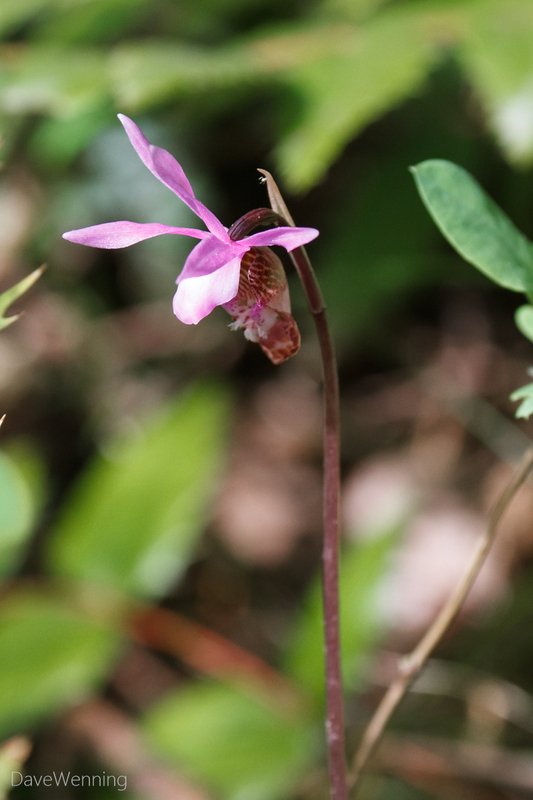 Right, only the most attentive will spot the little Fairy Slipper (Calypso bulbosa) at the edge of the trail. 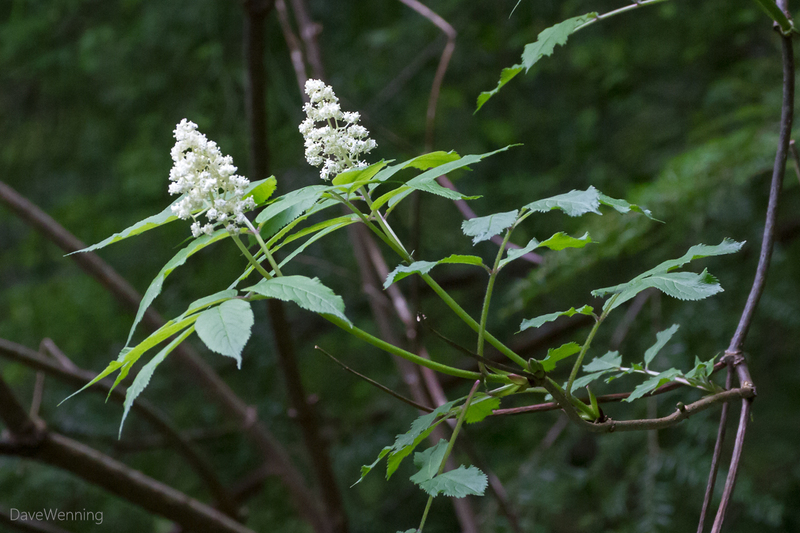 You can now see Red Elderberry (Sambucus racemosa) blooming along forest edges all over the Pacific Northwest. Often overlooked, this large shrub can produce a spectacular floral display. The flowers will be followed by bright clusters of shiny red berries. 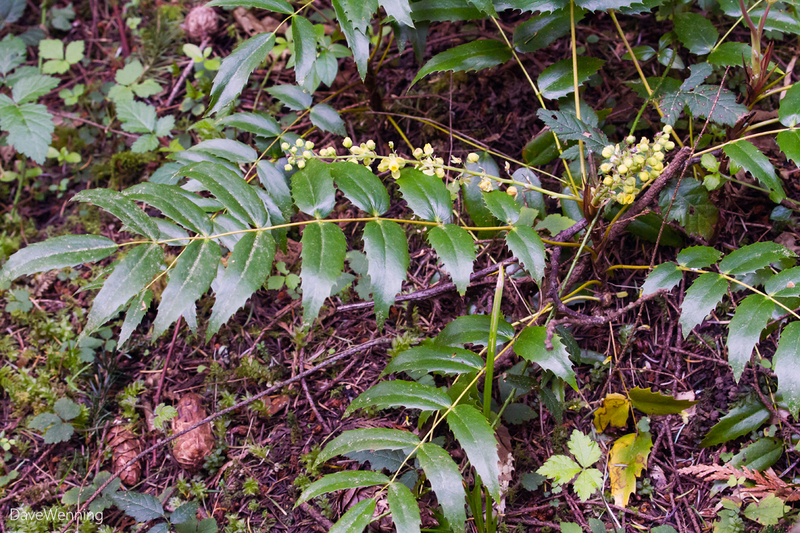 While the taller Oregon Grape likes to grow in full sunshine, its dwarf cousin Longleaf Mahonia (Mahonia nervosa) prefers the dappled shade of a mature coniferous forest. With Western Sword Ferns, it serves as a primary groundcover under the trees. You will also find it lining forest trails. It has several synonyms including Berberis nervosa, Cascade Oregon Grape, Low Oregon Grape, Dwarf Oregon Grape and Dull Oregon Grape. 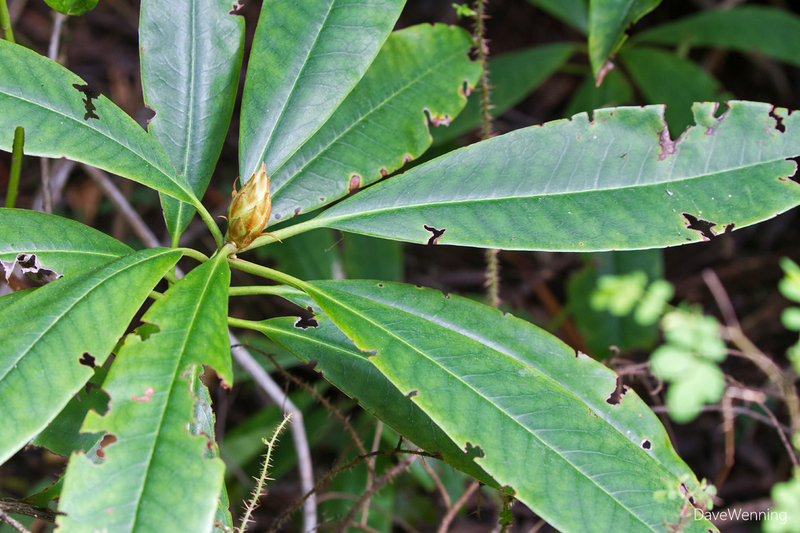 It rarely exceeds 2 feet (0.6 m) in height.